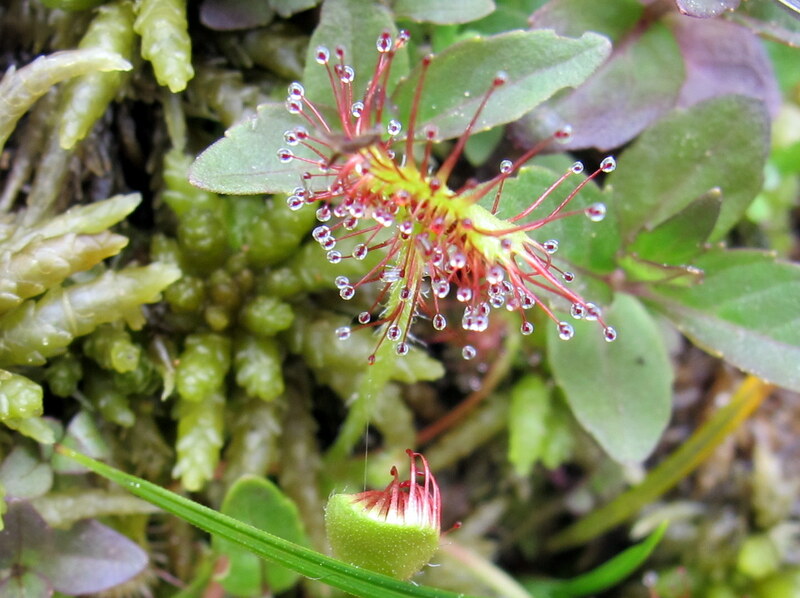 The round-leaved sundew (Drosera rotundifolia) is one of several relatively uncommon insectivorous plants found in Oregon. Unlike its (perhaps) more well-known distant relative, the pitcher plant Darlingtonia, this tiny beauty (it’s only a few inches tall) requires one to get up close and personal with the ground to get a good look at it. This is no easy task in the type of environment they need to grow (wet, mushy and very sensitive to trampling boots). The fen that’s home to the below pictured sundews was discovered by our state park botanist during botanical surveys, and we were lucky enough to see it during a short detour on an unrelated site visit to the park. I discovered that the liquid on the “hair” ends (or maybe more aptly named, tentacles) is not dew as it may first appear. Instead it is a special sticky substance that helps trap insects lured in by the tips of the bright crimson hairs. Once trapped, a process which involves the sticky tentacles wrapping around the victim, the insects are slowly dissolved. 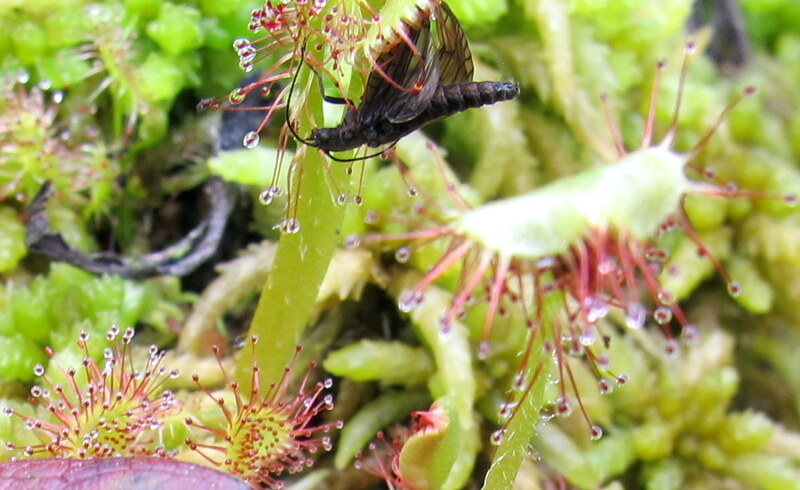 These carnivorous plants supplement their diet with bugs to get nutrients (particularly nitrogen), which are lacking in their bog-like environment. 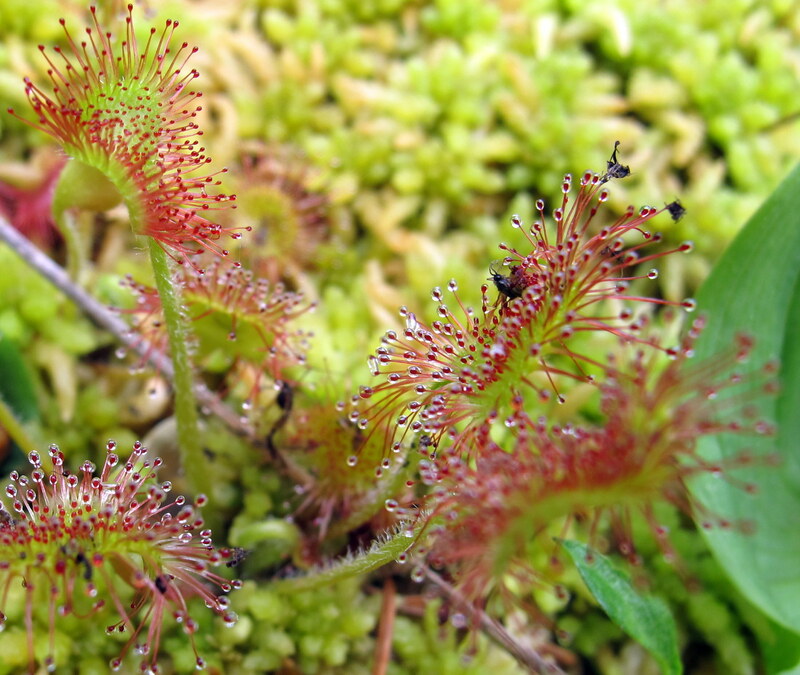 The sundews pictured here are living in a fen, a type of wetland, which is similar to a bog but hydrated with surface or groundwater (vs. primarily precipitation). Check out this Forest Service page for more information about bogs and fens. Carnivorous plants, including almost 200 species (!) 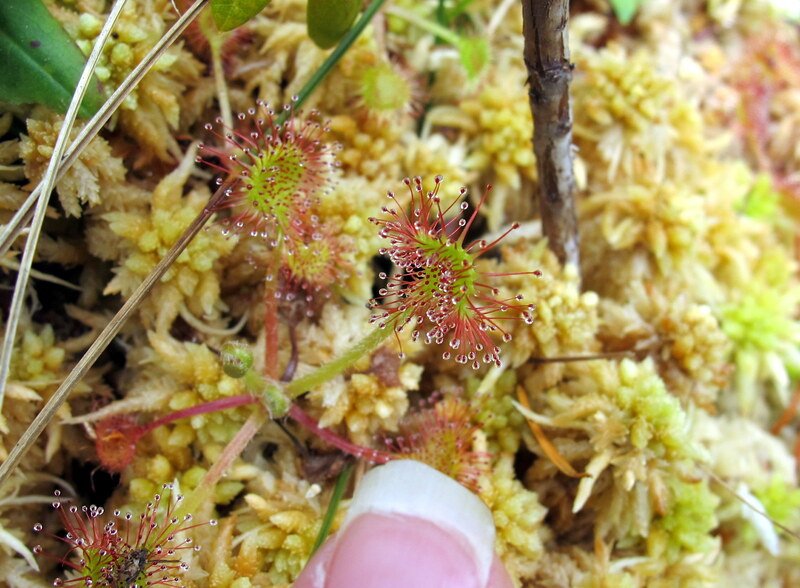 of sundews are found all around the world. 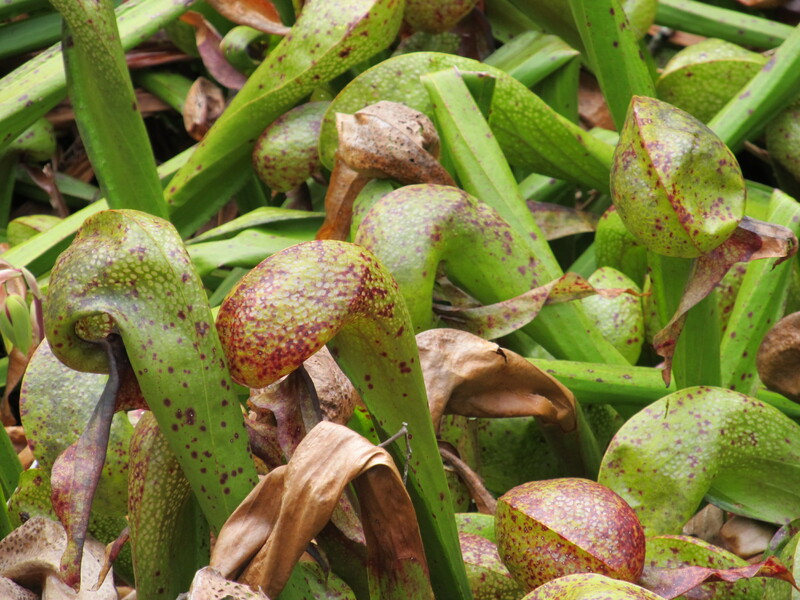 Although the famed Venus fly trap isn’t native to Oregon, you can see insectivorous pitcher plants (aka cobra lilies) in Oregon by visiting the state park wayside named after them (Darlingtonia State Natural Site). Pitcher plants (Darlingtonia californica) on the central Oregon coast.